It's much easier for a telescope to see deep into the universe when it doesn't have to peer through the Earth's atmosphere, but getting them into space is expensive. There is a much cheaper solution, though, as researchers have actually found a way to make incredibly light mirrors using lasers and polystyrene—aka styrofoam—beads. The size of the mirror that contributes to most of a telescope's bulk and weight, but also helps determine how far it's able to peer into the cosmos. The upcoming James Webb Space Telescope will actually have the largest mirror ever sent into space, but even then it will only be about 21 feet across, which pales in comparison to the telescopes here on Earth. So researchers from the Swiss Federal Institute of Technology are working on a way to build massive mirrors in space using lightweight building materials that are easy to blast into orbit. Believe it or not, though they're made of light, lasers actually create a small force when they hit a tiny particle. 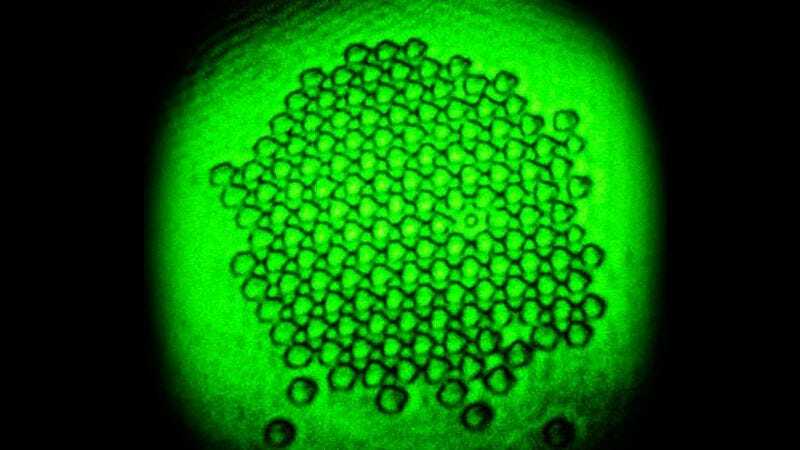 And taking advantage of this phenomenon, the researchers were able to trap extremely tiny polystyrene beads—just 150 micrometers in size—against a sheet of glass, turning the whole arrangement into a reflective mirror. Of course, the initial results weren't even comparable to the quality of the mirror hanging in your bathroom. But the researchers were able to discern the number eight after light beamed through a transparent ruler was reflected by the mirror onto a detector. Without the beads against the glass, nothing could be seen in the reflection. There plenty of hurdles still to overcome before we could see giant space telescopes made of styrofoam. The researchers are counting on the use of two lasers to hold the polystyrene beads in place, instead of a giant and heavy piece of glass. But that will require lots of power while the whole rig floats in space. And at the moment water plays a key role in those foam beads not melting, which doesn't exist in a vacuum. The list goes on.